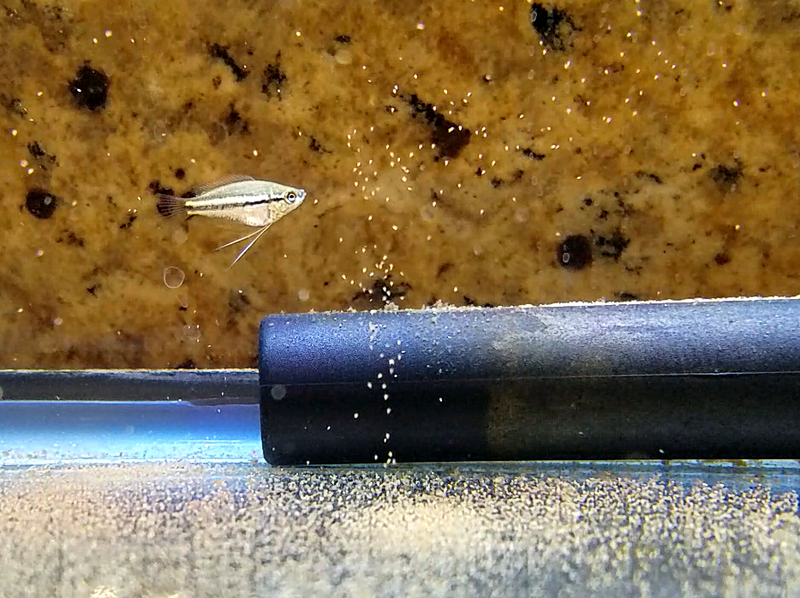 So I found out that feeding live baby brine shrimp (BBS) is one of the keys to really boosting the growth of your fish fry. But there’s so many methods for hatching brine shrimp or making a DIY hatchery – which one should you use? Keep reading as I break it down into detailed, bulletproof steps for you to follow along! Why Bother with Live BBS? I’ll admit, I stayed away from hatching baby brine shrimp the first time I raised cory catfish fry because I figured, well, prepared and frozen foods are less of hassle, right? The problem is that it took forever for the fry to grow up, almost 9 months to a year before I felt like they reached a sellable size. So when I started my second breeding project with honey gouramis, I knew I had to do things differently. Now when I interviewed veteran breeder Larry Brown on how to grow fish fry big and fast, he said, "Baby brine shrimp all the way!" Freshly hatched shrimp still have their yolk sacs, which is super nutritious for babies, and their jerky swimming motions really trigger the fry's feeding instinct. Plus, Dean who breeds fish for Aquarium Co-Op said that he feeds baby brine shrimp to the parents because they’ll breed more readily if they think there’s an abundant supply available for their babies to eat. The problem is that I heard hatching BBS is kinda messy and I was afraid it would take too much time and be unsustainable in the long run. Plus, I wasn’t sure which DIY hatching method would be the easiest and cleanest to use. 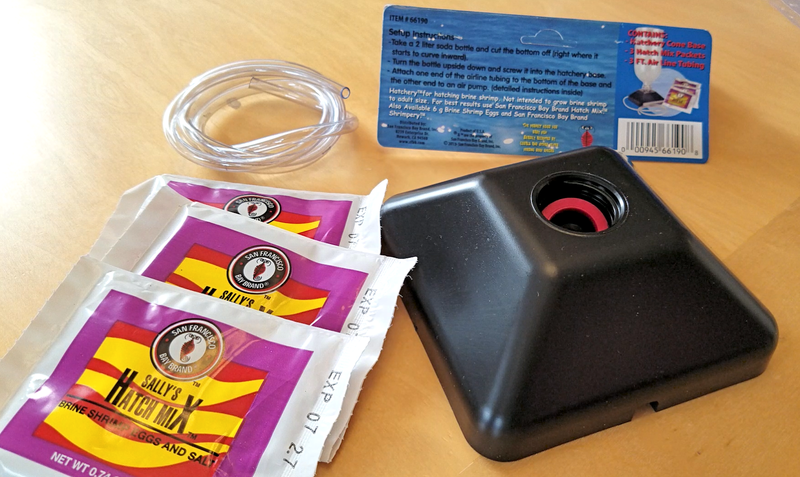 So to make things simpler, I went ahead and ordered the brine shrimp hatchery kit from San Francisco Bay Brand (SFBB). Cut off the bottom of the bottle right where it starts to curve. Insert the thermometer all the way to the bottom of the bottle. I have a digital probe, so I just taped the cord to the outside of the bottle so it wouldn’t fall out. Connect the airline tubing from the bottom of the hatchery to the air pump. To prevent any water from damaging the pump during a power outage, either connect a check valve in between or place the pump higher than the top of the hatchery. As an optional step, some people like to connect an air valve to the hatchery so they can easily turn on or off the air and prevent the brine shrimp from flowing out, but if you don’t have one, you can also just use a clothespin to pinch the tubing shut. Fill the bottle halfway with warm tap water at about 80°F (no need to dechlorinate it). For the 2 L bottle, I measured out exactly 1 L of water and then marked it with a sharpie on the outside. Note: Make sure the airline tubing is attached to the hatchery and is either closed off or has air actively running through it. Otherwise, water will spill out from the bottom of the hatchery when you pour it in. Turn on the air pump if you haven’t already and let the water bubble for a minute or so. If the bottle starts leaking, try to screw it in even more tightly, maybe using a rubbery jar opener pad to help you. If it’s still leaking, you may have a bad bottle with weak plastic like I did, so get another bottle. Add 1⅔ to 2 Tbsp of aquarium salt. And then to raise your pH to about 8.0 to 8.5, add about ¼ tsp of baking soda or ½ tsp of Epsom salt. 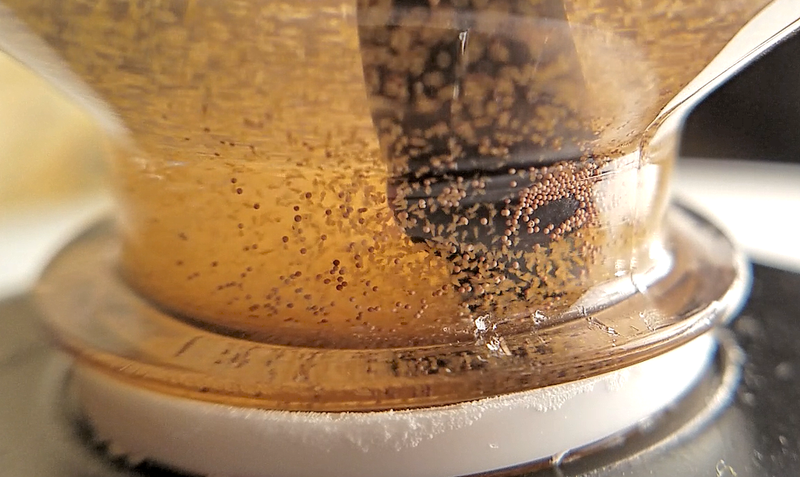 Add ½ to 1 tsp of baby brine shrimp eggs. If you add too many eggs, your hatch rate won’t be as good. Turn on the desk light and shine it from the top of the bottle. Aim for a temperature of 80-82°F. If the temperature is cooler, that’s ok – the eggs will just take longer to hatch, more like 30-36 hours. If it’s too hot at 85°F and higher, then it’ll kill the baby brine shrimp, so it's always better to go slightly cooler. Store the rest of the brine shrimp eggs in the fridge for up to 3-4 weeks or in the freezer for longer periods. Keep the eggs dry and don’t let them ever warm up to room temperature. Set a timer. In the first 2 to 6 hours, you’ll notice there’s a ring of eggs that are stuck above the water line, so knock them down by swirling the water or using a spoon. 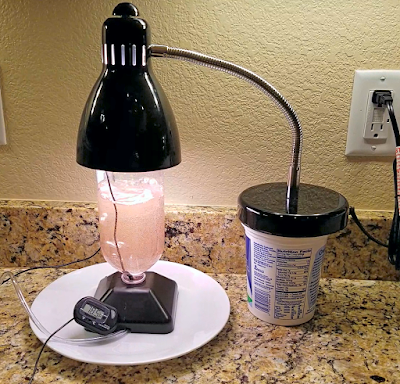 Keep the air pump and the lamp turned on the whole time while the eggs are hatching. After 24 hours, it’s time to collect them. Pro Tip: If you need smaller sized BBS for your new fry, you can collect them earlier at the 18-hour mark. Also, if you’ve been using eggs that have been in the freezer for a while, it may take up to 36 hours to hatch. Close the air valve or pinch the airline tubing shut with a clothespin, and turn off the air. This will prevent the liquid from flowing out. Shine your lamp at the bottom of the bottle, and turn off any other nearby lights. This will cause the shrimp to swim toward the bottom, leaving all the empty shells floating at the top. After 10 minutes, get a shallow dish to collect the shrimp. Open the air valve or clothespin and let the brine shrimp flow out until the liquid turns clear. If the liquid isn’t flowing out, try moving your collection dish lower than the bottom of the hatchery. I personally do not rinse the brine shrimp (e.g., using a brine shrimp net) because a little bit of aquarium salt in a large grow-out tank won’t harm anything, and Cory from Aquarium Co-Op hasn’t had any issues using this method in his fish room for 10+ years. If you don’t end up feeding all of the baby brine shrimp, store the collection dish with the brine shrimp solution in the fridge to slow down their metabolism and keep them alive for about 2 days. Take apart the hatchery and scrub it clean with hot water between uses. (Do not reuse the brine shrimp water.) If the hatchery is starting to get dirty or your hatch rates are decreasing, use some diluted bleach to clean it out more thoroughly. Easy peasy! 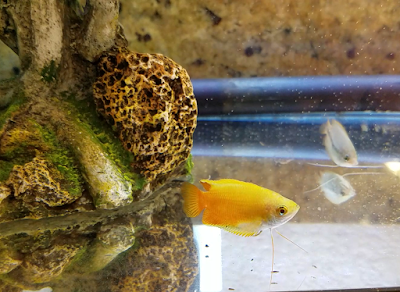 After my 2 honey gourami fry survived their first 2 weeks on infusoria, now they’ve glutted themselves on shrimp and are sooo big and fat. I can’t believe how fast they’ve grown! Now that I’m a brine shrimp hatching queen, would I buy the kit again? Pros: It’s super clean to use – I like that I can drain the BBS directly from bottom and minimize any spilling (aka rotting BBS on my kitchen counter). Plus, it’s really easy to take apart and maintenance. Cons: The hatchery kit costs $15 – buuut that’s not really a con for me because a) I’m not a great at building things and b) if I were to construct a bottom-draining hatchery, I would have to start from square one to buy all the parts and tools and it’d probably end up costing about the same amount, if not more. P.S. Jehmco also makes a really cool hatchery stand for about the same cost, which you can see in Inglorious Bettas’ video. Even adult nano fish go crazy for live baby brine shrimp! Have you ever hatched baby brine shrimp before, and if so, what worked for you? Comment below to share your experiences and share them with the community. 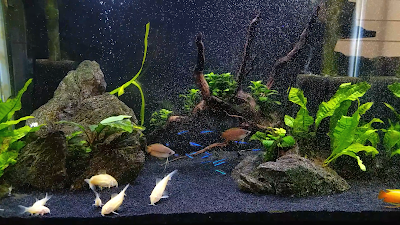 Also, if you’re looking for some fun and easy breeding projects, check out my article on how to raise cory catfish. Don’t forget to take time to enjoy your aquariums, and I'll talk to you soon!